Near my house, in the Chicago area, there is this great hot dog place called Portillo’s. Now they don’t just sell hot dogs. They have all kinds of specialty sandwiches, salads and Italian beef. Well one of my favorite salads they serve is called the Asian Chicken Wonton Salad. Actually I should say it was my favorite salad on their menu. Because they just recently discontinued it. I was shocked. And sad. But I decided I would have to go home and duplicate it because it was really just that good. So this Asian Chicken Wonton Salad is a perfect recipe to go along with our series that features fresh fruit: Our “Fruit-a-Palooza” series. The first recipe in this series was this delicious Bananas Foster French Toast. Fun to make and yummy to eat! Go check it out if you haven’t seen it yet. It is perfect for a weekend breakfast treat or to adorn the Easter brunch table! 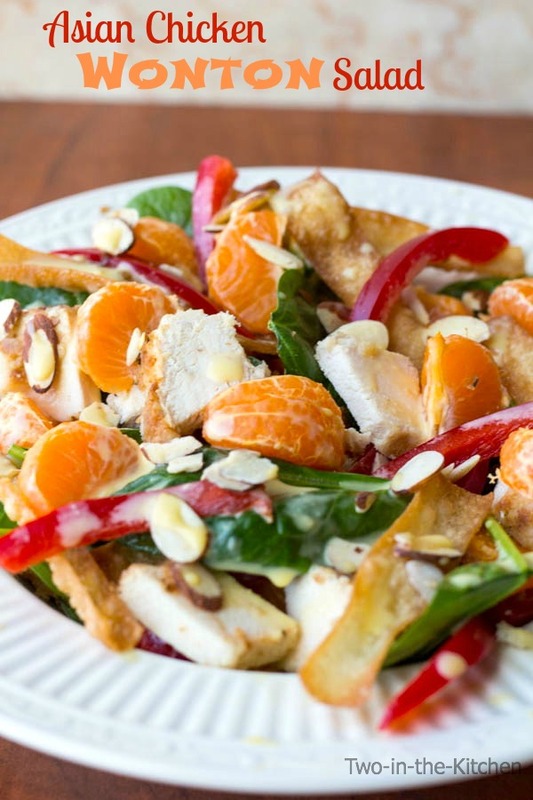 Now the star fruit in this fresh salad is clementine oranges. Don’t you just love how adorable and sweet they are!! 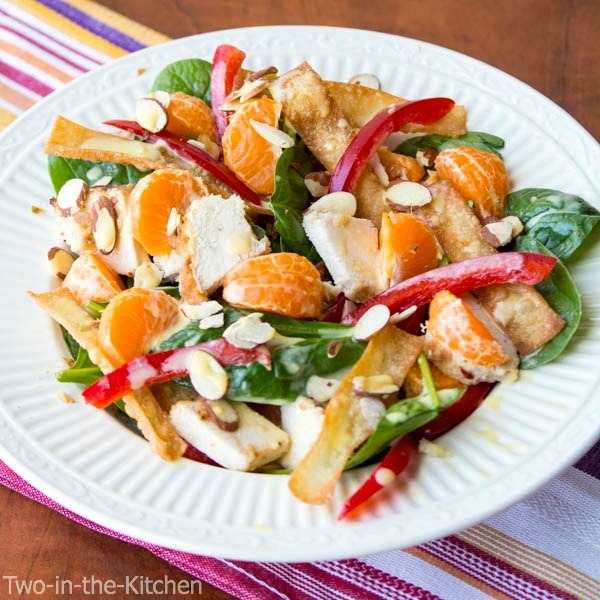 The pop of citrus from these oranges mixed in with the fresh red peppers, spinach and honey toasted almonds taste great together! The chicken I used in this recipe is oven baked buttermilk chicken breasts dredged in a red pepper panko crust! 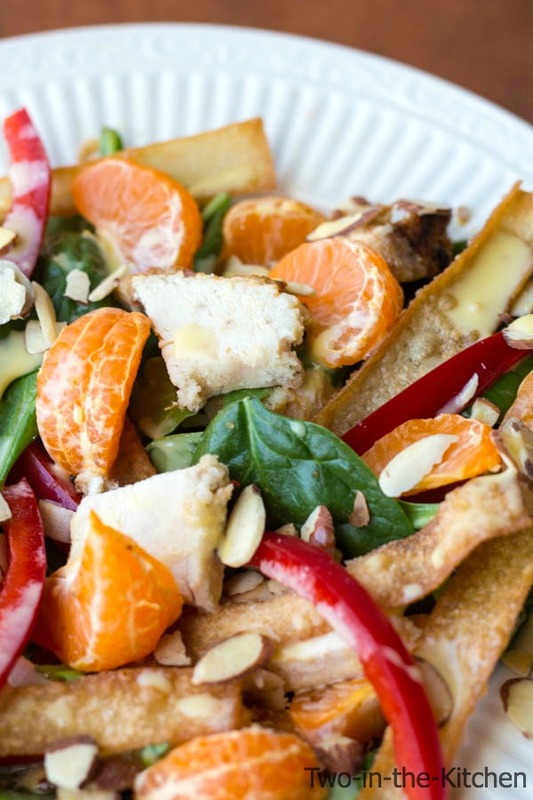 Filled with flavor and a bit zesty, the chicken tastes amazing in this salad. Finally, to top it all off, there are crunchy wontons and my husband, Erik’s homemade honey mustard vinaigrette! With all the fresh produce and zippy flavors here, this is a perfect salad for the start of spring!! Continue to join us over the next several days as we show you more ways to bring fresh fruit into your culinary repertoire as we move towards the sunny days of spring and summer!! Pour the buttermilk in a large bowl and after trimming the chicken, put it in the buttermilk, cover it, and place in the refrigerator for a couple of hours or over night. In a shallow dish, mix the bread crumbs, garlic powder, seasoning, pepper flakes, onion powder and salt and pepper. Dredge the chicken in the mixture and place in a large baking dish sprayed with cooking spray. Drizzle the top of the breasts with olive oil.Bake for 30-40 minutes or until the chicken is cooked through. Allow the chicken to rest and then slice it into 1 inch squares. Next, make the dressing by putting all dressing ingredients in a blender or food processor and blend until smooth. Set aside. Now prepare the salad. First, toss the spinach in most of the salad dressing, saving some to drizzle on top. Divide the spinach between two or three bowls. Layer it with the oranges, red pepper slices, chicken square pieces, almonds and wontons and then drizzle a little more dressing on the top. I hate when places stop making one of my favorite dishes 🙁 Such a great idea to re-create it yourself! This looks amazing – I love Asian salads! Doesn’t it always happen!! Thanks for the kind words Cate! This salad looks amazing Renee! 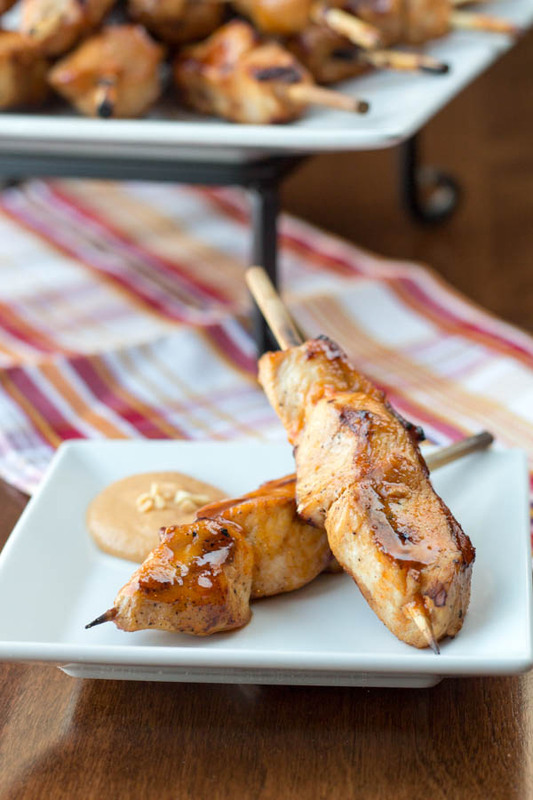 I love re-creating recipes from my favorite restaurants and eateries – they are always so much better at home. They taste better and are way cheaper too! Looks delicious- I love the fresh colours! What a fabulous-looking salad! 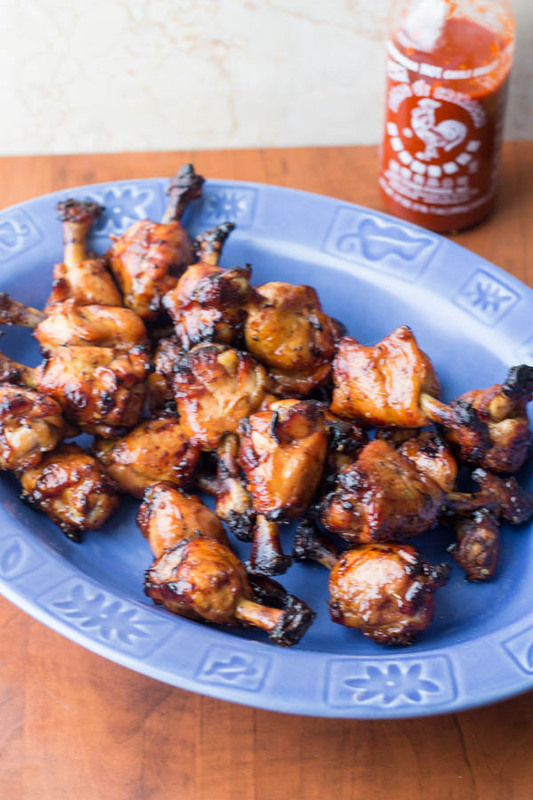 I especially love that honey mustard vinaigrette–Gotta try that! I would so love this salad for lunch today. pinned. That is exactly the idea Pamela! 😉 Bring on summer!! I love salads that are packed with delicious ingredients that aren’t made up of mostly lettuce…BORING! 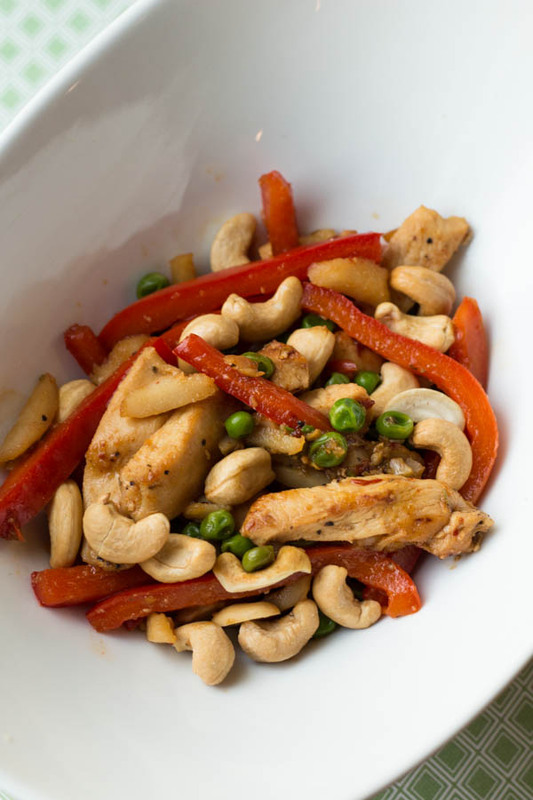 This Asian inspired salad looks delicious, Renee, and is one I would truly enjoy. 🙂 Pinning. Yes I do hate that because it always seems to be MY favorites that are stricken from the menu! Grrrr…. Oh well, it then just encourages me to recreate the dish myself! 😉 Thanks for the compliments Kara!! Found you over at Buns in my Oven – I am loving this salad!! Pinned to try soon! I am so glad you popped by Jaimie! Thank you so much for the compliments! !